Electronic air cleaners are also known as electrostatic precipitators(ESP) and are used to purify the air in the buildings or rooms. 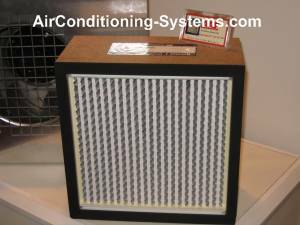 Their working principles are different from the HEPA filtering system. The HEPA filters mechanically remove 99.97% or more air borne particles of the size of 0.3 micron from the air by forcing the air through the filters. A powerful fan is used together with the filter for this purpose. When used in the HVAC system, this method of filtering is quite noisy and the air flow will be reduced. Duct System where the air is purified before being discharged into the space that is to be conditioned. Used and design by the engineers when they design the ducting system of the building. Part of the furnace system. Standalone portable system where you can move it from one location to another to clean the air in the room. This is usually used in homes. The pre-filter section is the beginning of the air intake in which the bigger particles are filtered out. Airborne particles such as hair, wool, dust and pollen will be trapped at this part of the filter. This section has a highly charged DC electric field. The voltage at this section is boosted high enough to cause particles to be charged with positive charges as they move through. As the air passes though this second section of the air cleaner, the particles are highly charged with the positive charges. These positively charged particles are then forced to pass through the positively and negatively charged plates. The positive plates will repel the charges and the negative plates will attract them As a results, all the positively charged particles are collected at the negative plates. These particles include odor, smoke and other air pollutants. The particles that are collected at the plates are then drained off manually during periodic maintenance or by the use of mechanical vibration. The plates will usually have to be cleaned using detergent to ensure that their surface area are free of contaminants to remain effective. Many newer design incorporate this final filter before the air is discharged into the room or being move to the next stage. Activated charcoal is also known as activated carbon and is made from coal or coconut shells. It is used to absorb gases from our rooms as the carbon is able to hold the gases. Regular replacement of carbon filter is necessary to ensure effectiveness of the filter. Here are some of the compounds that can be removed by having this filter in the air cleaner. Odors from pets, human or kitchen. Halogens, sulfur compounds and chlorinated hydrocarbons. Compounds from aldehydes, acids, alcohols, carpets and furniture. Those who are allergic to household contaminants will find that having the electronic air cleaners in the house will to a certain extent help them to increase their quality of life.